Process efficiency is a key goal for biopharmaceutical production, focused on increasing the process' speed, keeping costs under control, and building flexibility into the process, all while maintaining the quality of the final product. In this article, several different approaches and technologies will be detailed that can significantly improve the efficiency of upstream processing, including cell line development, process development and process intensification, real-time analytics, and process integration. Companies have been manufacturing biologics for many years, and until relatively recently the majority of these have been peptides, proteins, monoclonal antibodies, and antibody fragments. Biomanufacturing has largely been based around the use of stainless-steel bioreactors and fed-batch processes, with a conventional quality control (QC) and quality assurance (QA) routine used to release completed batches. The facilities have often been large, requiring high levels of investment, with a focus on fixed costs and a separation between upstream and downstream processing. As the needs of the industry change, biomanufacturing will also need to evolve along with them Figure 1. Drug developers are increasingly looking to move toward a greater degree of flexibility and responsiveness. This is due in part to the increasing demand for more complex biomolecules, as bispecific monoclonal antibodies, antibody-drug conjugates, oncolytic viruses, CAR T cells, and RNA interference-based drugs move through the pipelines. This increase in heterogeneity is resulting in the need for more flexibility and responsiveness in biomanufacturing. Other factors are also driving the need for greater flexibility and responsiveness. When drugs are in clinical trials, companies need differing amounts of product for the different stages of development. As the drug is approved and moves toward the market, supply chains will need to be put in place as quickly as possible. Once the drug is on the market, uncertainties in demand will remain. The uncertainties are driven by several different factors, including clinical outcomes; changes in dosage levels based on recommendations and clinical practice; the size of the patient population, which will change as new indications are approved; and levels of market uptake, which will depend on drug price and on competition. There will also be a need to buffer against cost pressure. This could be because of drug exclusivity, high development costs, or health systems' budgets. Creating a global presence can support flexibility and agility of response to sudden changes in demand, as well as meet the needs of countries where demands are increasing, such as India or China. Examples include creating smaller facilities using closed single-use systems at lower up-front and fixed costs in a number of different locations. The goal, therefore, is to create a flexible, efficient, and cost-effective manufacturing program that users can easily scale up or duplicate at the same or a different site, allowing for increased capacity locally or globally. Building this platform relies on streamlining the process step by step, beginning with cell line development, the basis of all biologics manufacturing. Traditional cell line development involves random transfection of cells, followed by cell sorting and evaluation of clones based on productivity and growth performance. The development can take around 40 weeks from start to finish. There are a number of potential approaches to enhancing the cell line development process. The traditional screening process involves placing single cells into wells in 96-well plates, and then screening 50 to 100 plates and picking out the highest producer. Instead, rather than screening individually, the operator can place cells into mini-pools, and then select the highest-performing pool of cells. This smaller population is then screened to get to single cells. The selection system can also make a difference. For example, using fluorescence activated cell sorting (FACS) in combination with the glutamine synthetase (GS) selection system speeds the process up further. Microfluidics can play a role in clone assessment and get results on proliferation rate and cell-specific productivities within five days. Streamlining the cell line development process begins with transfection. Instead of relying on random events, target integration allows cell line developers to insert genes in predefined “hotspots.” This specificity increases the creation of high-producing cell lines and reduces the amount of screening needed in the next step. When combined, these steps can significantly cut timelines for cell development down to as little as eight or 10 weeks and have a major impact by reducing the time to toxicity studies for the target biologic. The next stage of optimizing the process is moving into process development. This begins with the use of high-throughput systems such as plates, spin tubes, and microbioreactors, and then moves into parallel lab-scale bioreactor systems, from 250 ml up to 5 or 10 L scale bioreactors. These must reflect and predict the conditions and performance seen at pilot and production scale, in order for the scale-up process to be as smooth as possible. In-process analytics play an important role and should be automated and integrated within the upstream process and instrumentation. These analytics will provide a large amount of very important data, for example, from raw materials such as cell culture media and chromatography resin, from the bioreactor and capture steps, and from the drug product. The challenge, however, is capturing and storing the information and then evaluating it. Data is only valuable if it can be analyzed and made relevant. The process of data collection and analysis, from feeding all the data into one database or “data lake” through to the data analysis, is shown in Figure 2. To get more from the data and its analysis, the analytics process needs to look not just at the outputs but at the interactions between the different subsystems. For example, real-time monitoring can be used to predict how a batch will develop and to detect any deviations. Then, by comparing the batch with other batches, the process developers can get a greater understanding of how to improve the process and reduce errors. The closer analytics can be integrated into the process, the better. In an ideal world, real-time analytics both up- and downstream would mean the process can be modified “on the fly” from beginning to end, in order to improve quality and yield. The data feeds could include information from throughout the process, such as the raw materials going into the bioreactor, any chromatography data, and details from the purification and filtration steps. Many biopharmaceutical companies seek the benefits of process intensification by focusing on the seed bioreactor (N-1 stage). Two additional approaches are also gaining interest as a strategy to improve volumetric production capacity. The first uses a high-density, high-volume cell bank vial, which is expanded in a single step. The vial is used to inoculate the rocking perfusion bioreactor of 1 to 10 L, expanding the cells to sufficient volume and density to inoculate a bioreactor of up to 2,000 L. The faster process takes two weeks or less, halving the process intensification time. The second works by running the N-1 stage in perfusion to produce enough cells to inoculate the production bioreactor at a substantially higher cell density. As a result, the time in the production bioreactor can be shortened by about five days. The biology of the cell, as influenced by the genome, the proteome, and the metabolome, has an impact on the outcome of the process. By modeling the pathways and feeding the learnings from this into process development, it is possible to use systems biology not only to improve the host cell lines but also to improve the process design and media development. As an example of this, making changes to the system and then analyzing the mRNA of the cells can show changes in the up- and down-regulation of cell pathways related to cell cycle metabolism. This information can then be used to modify the media, improving cell-specific productivity. As outlined in the desired future state of manufacturing, QC and QA release is cumbersome and can have significant impact on timelines. Therefore, there is a need for methods that capture several quality attributes, and that can be run close online or at-line. Such rapid capture methods would also enable information on quality attributes to be fed back to the process. Integrated analytics and optimized processes open the door to the potential of automated systems. Automated systems can detect and handle deviations in the process and make corrections without human intervention. The next evolution of this automation could be connecting upstream and downstream, creating an integrated continuous biomanufacturing platform (Figure 3). A fully integrated system, however, would require high levels of precision, control, and execution, along with robust protocols to deal with problems. Cell line development, process development and process intensification, real-time analytics, process integration and automation are all important methods manufacturers are using to optimize process efficiency. 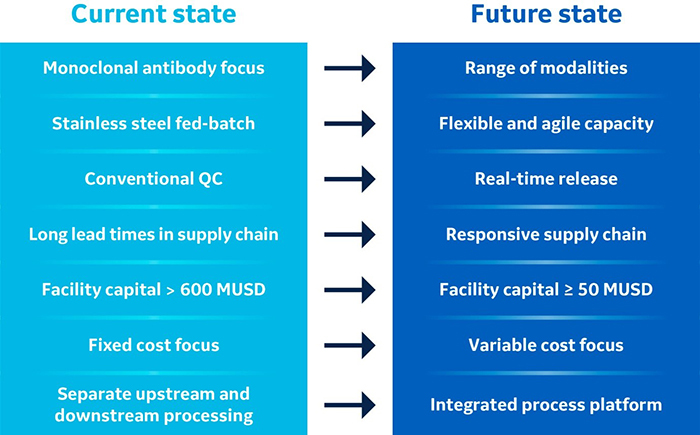 These steps, along with better approaches to heterogeneity in the pipeline, reductions in costs, and more flexible and agile manufacturing, are all necessary to meet the changing requirements of the biologics industry. The greatest impact, however, is likely to come from taking the next step in the refinement of the processes – increasing the integration of upstream and downstream processing and moving toward greater automation. The eventual goal, which is coming closer to reality, is a fully integrated and fully automated process platform running from cells and media through to a product ready for formulation.